Browse: Home /	Events, Intern Reports, LIVABLE STREETS, Public Places, Sustainable Flatbush News / Street Tree Walking Tour April 25th! Street Tree Walking Tour April 25th! What a tree-t! 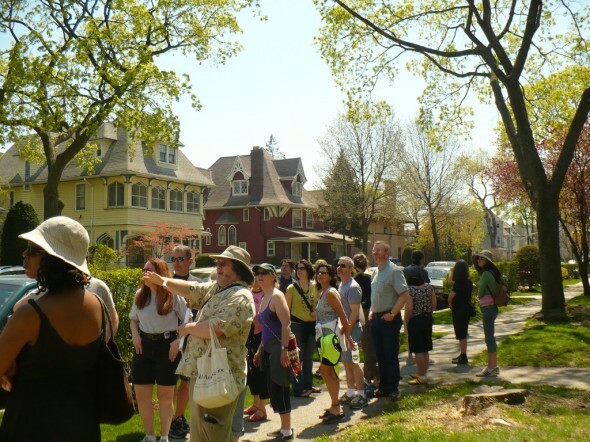 On Sunday, April 25, Sustainable Flatbush will host our fourth Street Tree Walking Tour! Join tour guides Chris Kreussling (better known as Flatbush Gardener) and Tracey Hohman (professional gardener) for a fun, fulfilling and enlightening tour of Brooklyn’s diverse canopy. On the Street Tree Walking Tour, you will learn to identify a variety of trees (think of how you can impress your friends! ), examine local natural tree history and tree lore (no textbooks needed! ), explore the way street trees benefit urban areas (you’ll become a tree’s best friend), and find out how you can obtain and care for street trees yourself! Become a street tree defender as you walk your way around Victorian Flatbush! The tour (recommended by Brokelyn as a great cheap date!) will take about two hours. Make sure to dress appropriately for the weather and the walk! The Street Tree Walking Tour is about “connecting people to streetscape,” according to Chris Kreussling. Street trees remind us that we are not separate from nature, but instead dependent upon it for our survival and safety. So grab a friend — or three! — for the walk of the season, and fall more in love with the beautiful foliage of Brooklyn! Keep an eye out for Sustainable Flatbush’s Street Tree Walking Tour next fall! The Steeplechase – Bed-Stuy Bike Ride! Support Recycling in NYC Schools next Tuesday! Spring 2014 in the Healing Herb Garden! Bus Rapid Transit Open House Monday November 15th! Flatbush e-Waste Recycling a Big Success!